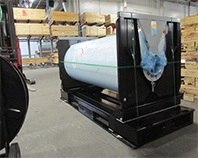 Roll Raptor replaces plastic, wood or MDF roll end boards and the wood pallet. Hinged end boards have auto lock, anti-tip during loading. Roll Raptor adjusts 20" for changes in roll widths. Can handle 2 different core sizes. 4 poly straps hold the roll tight, all of the straps are above the deck.